Jokowi is a phenomenon. Funny how his miraculous and idiosyncratic ascendancy has gone unheralded by the world press. They should be all over it. And they will be. They’re just a few hundred sluggish heartbeats behind you and I and the rest of us who live in the big world, and aren’t blitzed on Vicodin in a condo on a culdesac in benefit-rich America. 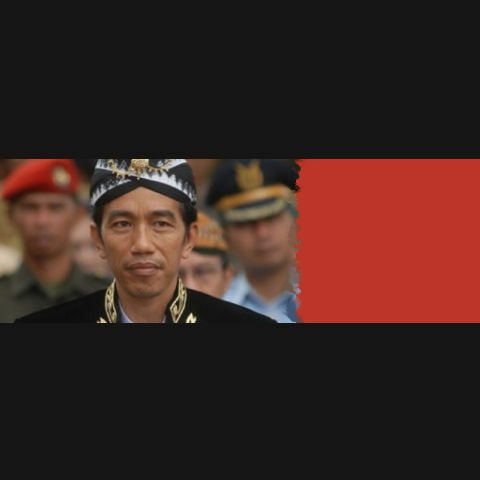 So, for the nerve-numbed victims of American and UK and European TV and newspapers and web-news, let me explain that “Jokowi” (his familiar nickname), is Joko Widodo, an arrestingly normal unassuming Javanese person, a simple citizen of Indonesia, who almost unwittingly, by saying what he actually thought, and sparing his time and energies for earnest efforts to make his simple visions manifest, became Mayor of Surakarta (Solo), a very large city in Indonesia. His mayorship worked out very well indeed, and Solo (already a very interesting and ancient and thriving city), became a much better place for pretty much everyone. After that, oddly enough, Jokowi has suddenly become Mayor of Jakarta, one of the very largest and most complex cities in the world. When he took office last week, he did so as only the second Mayor of Jakarta ever to have been elected by the people. And let me tell you, there are a heck of lot of those people there (around 11 million), and almost all of them are textbook examples of today’s “urban poor”. The “urban poor” in Jakarta, are by no means poor in the sense of being naive, craven, criminal, or huddled masses; they’re a spirited lot. They read, and they talk (a LOT), and they have (now) very broad and well-defended freedoms of speech and expression (thanks, in the first instance, to President Habibie and a cloud of smart people around him, but that’s ancient history now, it all came to pass quite smoothly way back in 1998). OK, the point is, I’m saying that the people of Jakarta are a force to be reckoned with, not a seething violent mass of yobs, and certainly not a hotbed of fanatics of any persuasion. They’re kind of unique in that regard. They’ve been so numerous, and so disenfranchised, for so long, they’ve developed (over a millenium or so), a very pragmatic esprit de corps, and effective ways and means of getting on with their lives and building webs of community that sustain them individually and collectively, through all manner of challenges. Just start with the inevitable septic and massive floods that occur every single year and get worse and worse. Other challenges have been the contrasts and frictions of impingement on their relatively peaceful and well-entrenched (albeit crowded) community spaces, by a tide of development and brutal new wealth marching its stiletto-heeled Jimmy Choos across their accustomed turf. Leave the rest of their challenges to another post, let’s get back to Mas Jokowi. I am impressed by his courage and humility. He kindles a new flame of hope not only for Jakarta and for Indonesia, but for the world. Ok, I know . . . we’ve had high hopes many times in Indonesia, only to see them dashed to the ground yet again. But there’s a fundamental difference in the form of leadership Jokowi embodies . . . and Obama . . . and certainly Aung San Suu Kyi . . . and others who are stepping forward in service to humanity. They are motivated by a calling, rather than an ambition. They are motivated by being of benefit, rather than accumulating benefits themselves. What distinguishes such exceptional leaders is this: They don’t persuade us to get behind them; instead, they expect us to walk beside them, and they call upon us to step out in front of them, to go further than they ever have or will. Their courage, therefore, is not a mere inspiration, but a mandate. That’s the difference. I googled around looking to see if and how the world press had cheered on Widodo’s modest and self-effacing rise to altruistic servitude (and inevitable conflict, with martyrdom not ruled out ever), as the new Mayor of Jakarta. Hardly a single whisper anywhere. I guess the world has (once again) failed to pay adequate attention to Indonesia. If there were a game-show buzzer I could hit to make a nasty “ZHNNGGHAAAAHK” sound signalling their losing round, I’d hit it right now. Team World Press totally muffed this round. Good luck on the next one. The people of Indonesia had the right answer, and go on to the next round in the lead, with an Amana fridge-freezer, $500 bonus money and a chance at an all-expenses-paid trip to Cancun in a pink Cadillac. They’ll enjoy the trip. But only if their in-laws and kids and cousins and uncles and neighbours can come along, too (that’s very much the urban Jakarta style of holiday). A few extra tikar on the hotel room floor, and believe me, everyone will be happy together in one standard double deluxe, no problem sharing the bath. One question: Can Jokowi go, too?